President Reuven Rivlin commented this evening on the passing of Religious Affairs Minister David Azoulay and said, “I was so sad to hear of the death of my friend, Minister for Religious Affairs David Azoulay. "David was one of the politicians most connected to all the tribes of Israel. He was a man of Akko, his town, who faithfully dealt with the needs of the public his whole life, along with his endless devotion to his wonderful family. Azoulay passed away today at age 64. He has been struggling with cancer in recent months, often missing work at the ministry due to his illness. Prime Minister Binyamin Netanyahu eulogized Minister Azoulay, saying "The Government of Israel mourns today the death of our dear friend, the late Minister David Azoulay, who has passed away. For a long time we prayed for David to be healed, who was fighting a serious illness. Unfortunately, his struggle for life ended a few hours ago. David served for more than two decades as a Knesset Member and initiated many laws designed to benefit the country's citizens," Netanyahu said. "He was an excellent and diligent Minister who enlightened everyone, loved peace, and pursued peace. He will be missed by me and all the members of the government. We send deep condolences to his wonderful family, including his son Yinon, who continues his career as a Knesset Member. David will be missed by us all very much. May his memory be blessed," added the Prime Minister. Interior Minister and Shas Chairman Aryeh Deri said, "I'm crying for my dear friend, my beloved, long-time partner, Rabbi David Azulai, who has now passed away after much anguish and was only 64 years old. Rabbi David was straight, humble, a man of action, a true tzaddik; he died and left his family, the family of Shas and the House of Israel, sore and lacking. May he be of blessed memory." Justice Minister Ayelet Shaked said "Religious Affairs Minister David Azoulay was a special person, modest and kind. I worked with him every week; he made sure to attend meetings of the Ministerial Committee on Legislation where he was a member, whenever he could. He always came prepared, made sure to study the material and express clear opinions on all the issues at stake. I'll miss him very much. May his memory be a blessing." Education Minister and Jewish Home Chairman Naftali Bennett eulogized: "The late Minister David Azoulay was a good-hearted man. A true public emissary who connected between the various public sectors with humility. He immigrated from Morocco, served in the IDF as a combat medic, and worked extensively in the local and national arena. David, your smile will be missed. Blessed is the True Judge." MK Michael Malkieli (Shas) said "the passing of Religious Affairs Minister Rabbi David Azoulay is a hard and sad tiding to the people of Israel in general and to me on a personal level. The people of Israel today lost a special man who worked for decades for the welfare of Israel out of the spotlight and quietly, and carried out major revolutions. "At this difficult hour, we send condolences to his righteous wife and all the dear family members, whose tremendous dedication throughout the difficult period I have been privileged to see," added Malkieli. Deputy Defense Minister Rabbi Eli Ben Dahan said "Rabbi David Azoulay was a sincere and loyal man. He was a leader devoted to the Jewish People, G-d's Torah and His Land, a modest and humble man who was an example of true leadership." Jerusalem mayoral candidate Zeev Elkin also eulogized. "The government of Israel lost a very dear man today - Religious Affairs Mionister David Azoulay, a very rare breed in politics; on the one hand a gentle man of great character and heart, and on the other hand, a keen man for whom love of Israel was in his heart," Elkin said. "Throughout his many years in the Knesset, he worked for the entire population and promoted many laws. We worked together in the Ministerial Committee on Legislation where he was very active, as well as in the rest of the Knesset parliamentary activity. I send condolences to the members of the extended family who lost, together with the people of Israel and the government of Israel, a special person we will always remember." Deputy Foreign Minister Tzipi Hotovely (Likud) said, "My heartfelt condolences to the dear Azoulay family for the untimely demise of our friend, Religious Affairs Minister David Azoulay. Minister Azoulay was a man of action, a pleasant and modest man, and he will be very lacking in public life." MK Elazar Stern (Yesh Atid): "I share the condolences of the family of Minister David Azoulay, a modest, pleasant man and a loyal public servant who invested so much to avoid confrontations. A loss to his family, the Shas movement, and the State of Israel." Agriculture Minister Uri Ariel said "only a few hours ago I visited the Minister of Religious Affairs Azulai at his home in Haifa, and now the bitter news has come. Azulai was a close friend, a man of action who constantly worked for the people of Israel. I send my condolences to the family. May his memory be blessed." 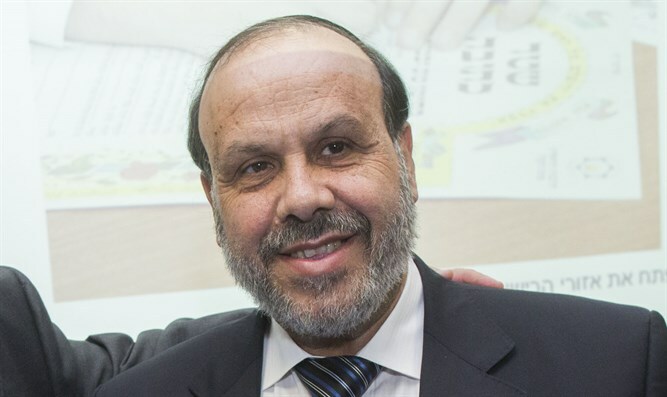 MK Stav Shafir (Zionist Union) said: "The Minister of Religious Affairs, David Azoulay, who passed away this evening was a kind, honest and humble man, a public emissary in every sense of the word. I liked and admired him very much. May he be of blessed memory." Culture and Sports Minister Miri Regev said, "I'm hurting and bowed with the passing of my dear friend David Azoulay, a wonderful person, an excellent parliamentarian and a great minister who worked very hard for the citizens of the State of Israel. We cooperated in advancing important laws and I was exposed to his public, social, and national sensitivity. "David was a man who truly loved Israeli society, the Land, and the Torah of Israel. He struggled like a hero with a severe illness, but he didn't have the strength. May his memory be blessed," added the Minister. Knesset Economics Committee Chairman MK Eitan Cabel (Zionist Union) said "Minister David Azoulay, who died this evening, was modest and achieved much in the Knesset and in the government for the weaker groups. His pleasant personality will be lacking in the political landscape. We send condolences to his son, MK Yinon Azoulay, to his family, and to the entire Shas movement." MK Ilan Gilon of Meretz said, "Minister David Azoulay was a very dear and beloved man, and during all these years of our acquaintance, I saw a decent and honest person before me, an ultimate public emissary who saw himself as a servant of the public and not the opposite. Yinon Azoulay, a fine man I am sure will continue in the same way as his father, and the rest of the family. May his memory be a blessing."